Today was his first day of Kindergarten. While he is only five years old, Noah is an old soul. We have come to count on his maturity and his steadiness. Today was like any other day for Noah – he was positive, enthusiastic, and composed. If only Patrick, Brady, and I would have taken his lead. The three of us were a mess. We let it all hang out today. I obsessed over his lunch. Patrick called it Noah’s “man lunch” because of the enormous portions. To me, the success or failure of Noah’s day was based on his lunch. And then there was the bus stop. The entire time I was at the bus stop I had a terrible stomach ache. 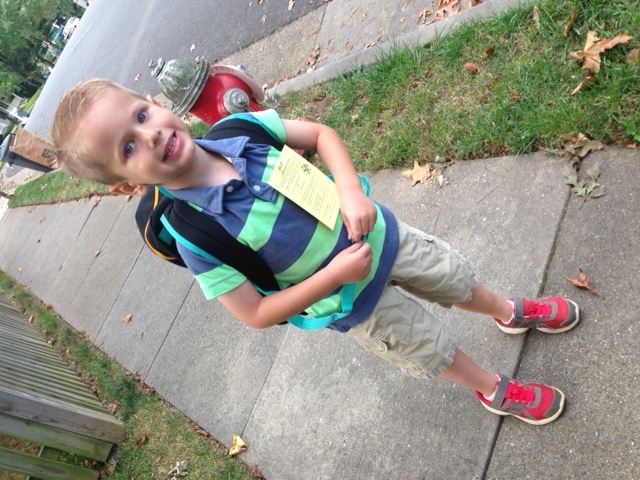 I didn’t recognize it as stress….until Noah stepped onto the bus and I started crying. Then there was Patrick. Noah’s elementary school invited parents to a Kindergarten parent coffee at 9:30 am in the cafeteria. Patrick took that as his cue to jump in his car; follow the school bus; and videotape Noah getting off the school bus. He then proceeded to walk behind Noah to his classroom and videotape him doing a coloring sheet. He did manage to make it to the coffee…where he was one of about 15 parents present. Bless his overprotective heart. 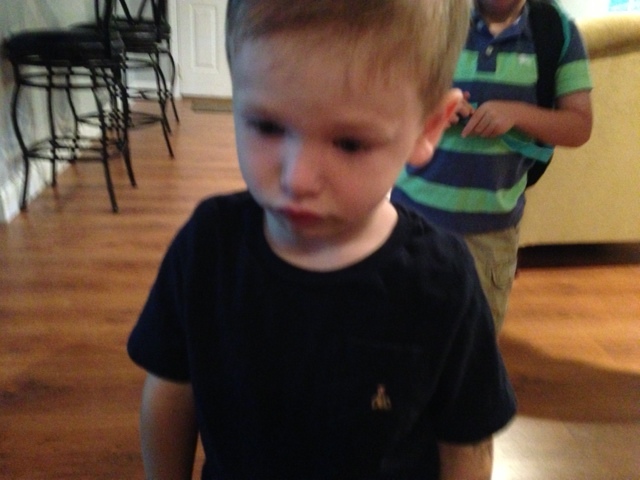 This is the classic Brady pout pose. Clearly, Noah is going to have to carry this family through the remainder of this adoption roller coaster. The rest of us really cannot keep our composure.